Supreme comfort and great sound make for a headset that can go the distance in marathon gaming sessions. It's bulky size makes it less than portable, but its quality instruction makes it very durable. From things like an adjustable fit to the right tone, to a perfectly soft fit around the ears and a cord that is just long enough without being obnoxiously so, finding just the right headset to accompany your game time can be a difficult prospect – particularly if you are a gamer on a budget. The new HyperX Cloud headsets from Kingston promise a great fit and unparalleled comfort for those long gaming sessions, and we took them for a test drive to see how well they hold up to those promises, hour after hour. You can argue with your friends about the benefit of controller over a mouse and vice versa, laptop or desktop, even Windows versus Mac versus Linux, but there’s one thing every gamer can agree on – the right sound is essential. 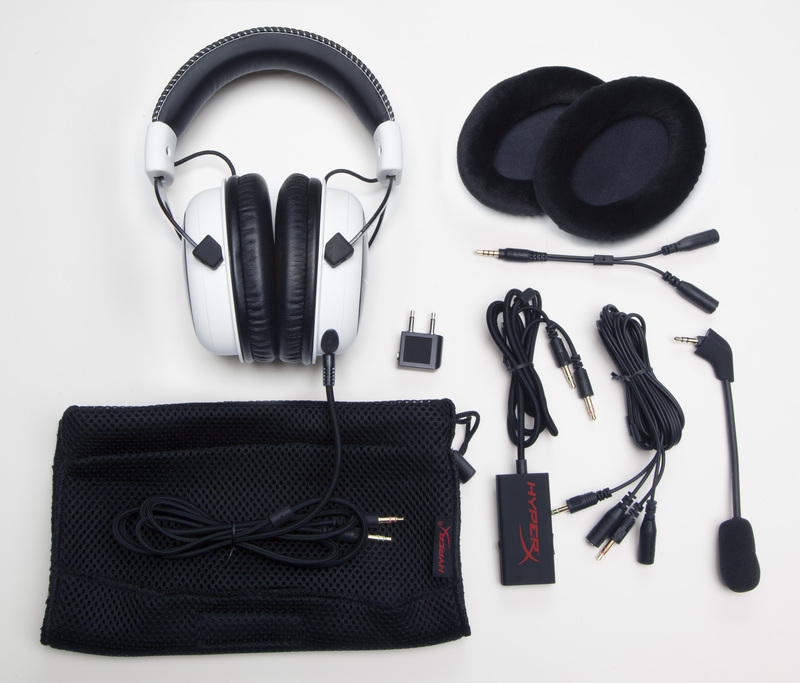 From things like an adjustable fit to the right tone, to a perfectly soft fit around the ears and a cord that is just long enough without being obnoxiously so, finding just the right headset to accompany your game time can be a difficult prospect – particularly if you are a gamer on a budget. The new HyperX Cloud headsets from Kingston promise a great fit and unparalleled comfort for those long gaming sessions, and we took them for a test drive to see how well they hold up to those promises, hour after hour. As you open the box, you quickly find that Kingston has taken great care with every aspect of this headset – including the packaging. The headset is packed up like it is the crown jewels of a small European country. 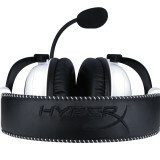 The outer box opens to reveal a very thick inner box with a sleek HyperX logo across it. Inside this case, the headset and its various pieces nestle inside heavy foam packaging which ensures that every component arrives in pristine condition. There is quite an overpowering chemical smell when you first open the box, though, which is a bit off putting at first but quickly dissipates with a bit of fresh air. As you lift it out of the box, you’ll notice right away that the HyperX Cloud is a hefty piece of technology with a rather chunky aesthetic. It’s not overly heavy, but it does have a bit of weight to it. That’s not necessarily a bad thing, as it speaks to the quality of the construction. The generously sized ear pieces are of matte finish plastic that is velvety soft to the touch. 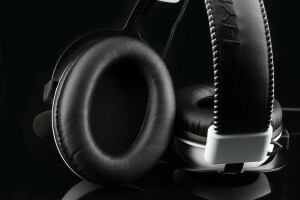 The ear cups themselves come in two options – smooth leather or fluffy velour (both included at no extra cost). Whether you are the type to switch back and forth or just find what you like and stick to it, this is a nice touch that lets you try out both for optimum comfort. While the leather cups are quite smooth and slide softly onto the ears, the velour cups offer their own advantages as well, particularly with air flow and in sweaty situations (ew). Whichever ear cups you choose, when they rest on your ears they immediately dull the sound around you with a nice snug fit that is quite comfortable. The headband is a softly padded artificial leather that rests comfortably across the top of your head. It is black in color, with white stitching along the sides and a black stitched logo across the top of the band. The headset is easily adjustable by pulling on the sturdy black aluminum arms on each side, which extend around to attach to the ear pieces. 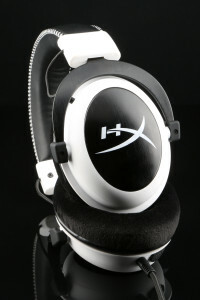 The aluminum is thick and modern, adding both durability and style to the headset. As a gamer with a smaller sized head, I was happy to see that I was easily able to adjust for a perfect fit, and it even goes small enough for the little gamers in our household to enjoy. Larger gamers should find a nice fit as well, and once adjusted the headset holds in place without any noticeable slippage. Let’s address compatibility real quickly. The HyperX Cloud is compatible with both pc and mac, as well as PS4 and mobile, making it a versatile headset that can move from gaming to on the go if need be (although keep in mind that the larger size does make them significantly less portable than a set of earbuds). The mic is quick and simple to detach, and the control box attachment gives you audio controls at the push of a button, as well as adding length to an already respectably long cord. As far as bang for your buck goes, the HyperX Cloud comes with all kinds of accessories you often have to shell out extra for, and that adds a lot of value to the price tag. You get a nice long extension cable, a headset splitter, and an airplane adaptor, as well as a thick black carrying bag that cinches at the top to keep everything in and even has a velcro side pocket for your accessories. Even with all those cords and pieces in the box, there isn’t any sort of manual included in the packaging. However, if you’re having trouble figuring anything out, you can head over to Kingston’s website for easy access to an instruction manual. Comfort is undoubtedly important in a headset, particularly for gamers who are fans of the long session, and I must say that Kingston delivers a near unparalleled level of sheer comfort with this headset. The memory foam in the ear cups is a genius touch, and makes for a level of softness that is noticeable the minute you place them around your ears, and this combined with the generous amount of padding on the headband allows for marathon gaming sessions in perfect comfort. The chunky high tech style is also a nice touch, even if it doesn’t generally rank first on most people’s lists of headset requirements. The sound, though – that’s really where it’s at. A headset can be soft as a cloud and hella cool, but if the sound isn’t up to par then it’s basically an expensive piece of junk. I tested the HyperX Cloud under a variety of conditions, and was pleasantly surprised by both the clarity under gaming conditions and the suitable mellow sound for music. Every click of a footstep and bass beat were equally distinguishable, making it a very versatile piece of tech and a great asset for game time, particularly when you consider it’s reasonable price tag. 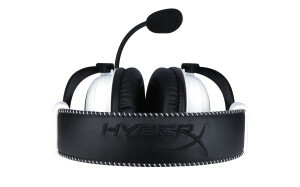 The HyperX Cloud Headset is a great choice for gamers who want a lot of bang for their buck. With a variety of extra accessories included, it’s a headset that goes from gaming to music and videos without a beat – fitting in with your busy lifestyle without missing a beat.